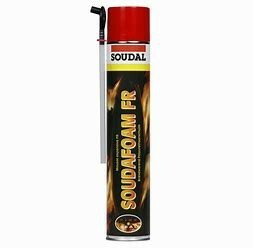 Soudal B1 Fire Foam is a modified single component, fire rated polyurethane foam. Can provide up to 4 hours fire protection to building gaps and linear joints. Has also been designed to limit smoke movement and maintain the acoustic performance of the substrate. Requiring no gun for application and features ergonomic cap system for ease-of-use, improved yield and accurate dosage. Gun version also in stock.